The discussions to establish a European Business History Association followed in the wake of the successful foundation of the Association of Business Historians in Britain . Informal talks between Hans Pohl (Bonn), Geoff Jones (Reading), and Tony Slaven (Glasgow) resulted in an invited meeting of representatives from a number of European countries in October 1993. This meeting was hosted and chaired by Tony Slaven at the Centre for Business History in Glasgow. The participants were not representative in any objective sense, but were those known to the organisers. They were Rolv Peter Amdam (Norway), Michael Bibikov (Russia), Per Boje (Denmark), Hans Pohl (Germany), Keetie Sluyterman (Netherlands), Mary Rose, Geoff Jones and Tony Slaven (UK). Peter Matthias, Francois Crouzet and Michel Lescure were unable to attend. That meeting reviewed models for an EBHA, objectives, and necessary steps to shape and establish a new association. Subsequent meetings chaired by Tony Slaven followed rapidly in Bonn in February 1994 and in Rotterdam in June 1994. By this time the initial group had been joined by Francois Crouzet (France), Ulf Olsson (Sweden), and Evan Lange (Norway). The meeting in Rotterdam at Erasmus University in June 1994 established the first draft of objectives, the conditions of membership, the structure to be adopted for office bearers and members of council, and election procedures. 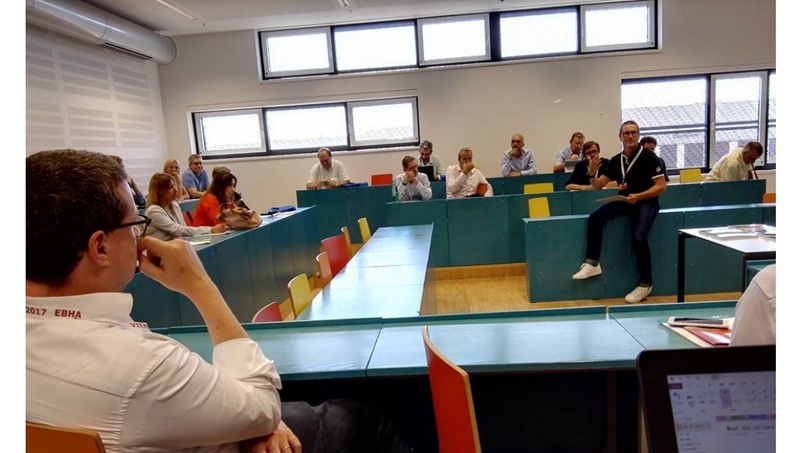 The Erasmus meeting also decided that it was necessary to take the proposals to a wider forum to gain support for the creation of a European Business History Association; it was also decided to establish a steering committee to plan a first conference. The inaugural conference in Gothenburg in August 1996 attracted over 230 participants by which time the initial paid up membership of the new EBHA was 214 members. First nominations and elections for council added Franco Amatori , Albert Carreras, Wilfried Feldenkirchen, Ritta Hjerppe, and Matthias Kipping to the first formally elected council. Tony Slaven was adopted as first President of EBHA with Geoff Jones as the first Secretary/Treasurer. In 1995/6 the initial intention of the Council had been to hold a conference every two years, but in 1998 it was decided to hold an annual conference beginning with that held at Terni. Since then we have met annually and successively in Rotterdam, Bordeaux, Oslo, Helsinki, Lowell, Barcelona, Frankfurt, Copenhagen, Geneva, Bergen, Milan, Glasgow, Athens and Paris. From small beginnings in 1993 we have over 250 members drawn from 29 different countries and EBHA has been a remarkably successful association greatly strengthening the status and significance of business history world wide.